Frown lines (also commonly called ‘number 11’s’) are probably the most common treatment area for botulinum injections (Botox® or Dysport®). 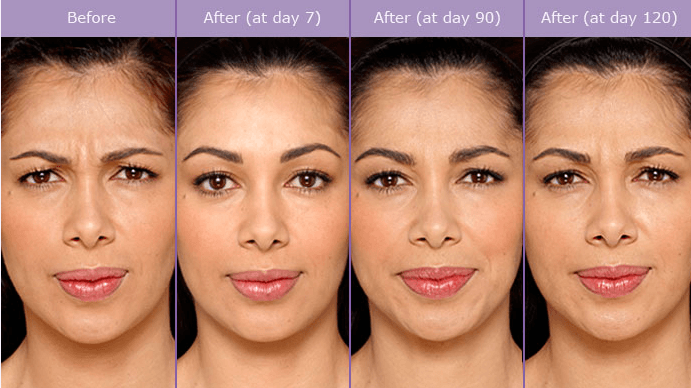 In fact, most people start their journey with botulinum injections by having their frown lines treated. Frown lines are caused by contraction of the corrugator and procerus muscles (also referred to as the glabella complex). An advanced understanding of facial anatomy is required to treat this muscle group, as poorly placed injections or incorrect dosage often results in a dropped brow or droopy eyelid. Whilst botulinum injections generally satisfy most clients concerns in this area, sometimes dermal filler (such as Restylane®, Juvederm® or Emervel®) is also required to smooth the lines. A common symptom or complaint is clients saying they look tired all the time, worried or angry when they aren’t. If people are often asking you “What’s wrong?” when nothing is, perhaps a small botulinum treatment could bring you a great result! Click here to read the Consumer Medical Information about Botulinum Toxin.